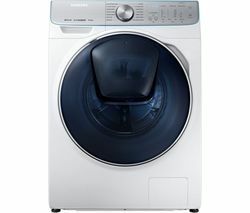 Samsung is a leading manufacturer of great washing machines. Installing a Samsung washing machine in your home will save you time and energy on laundry days and cut out the need to take your washing to the launderette. Samsung washing machines are versatile so they can adapt to your needs. If you regularly have to wash large or especially soiled loads you’ll appreciate the extra power and advanced technology that comes as standard with a Samsung washing machine. If you’re in a rush or have a smaller load than usual you can run a shorter cycle that will get the job done quickly and efficiently as well as using less water and minimising the impact on the environment. Samsung washing machines that have a larger load capacity are ideal if you have a big family or regularly wash larger loads and you’ll soon notice how much time and energy you save when you have to do fewer loads. No matter which Samsung washing machine you choose, from the Samsung ecobubble™ WF70F5E0W2W with its economical 7kg load capacity to the Samsung ecobubble™ WF1114XBD/XEU with a huge 11kg capacity, your clothes will always come out fresh and spotlessly clean. 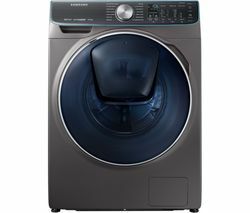 Whether you want to wash clothes, curtains, or fluffy children’s toys, a Samsung washing machine is a fantastic option. Take a look at our full range of great washing machines from brands such as Hotpoint, AEG, Bosch and many more.